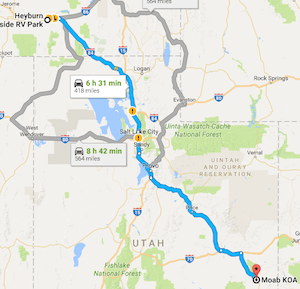 4/7/2017 Day 2 Heyburn, ID to Moab, UT. This morning I woke up around 7:30 am local, to a cop parked between me and Mike, and saw him leering at our rigs. By the time I was dressed the cop had left and Mike told me he had asked that we leave ASAP as there were signs stating not camping (Right behind my rig), we’d missed in the dark the evening before. We rolled out to the truck stop to grab breakfast and fuel before continuing our trip. I gassed and drove around by the diesel pushers to park and grab breakfast. We did our best to stay out of the trucking lanes but I was facing the wrong direction to get out which meant I had to do a large u-turn and in doing so caught a bit of curb with the trailer that would bite me later in the day. Our friends Andy and Steve pulled out ahead of us with their diesel pickups pulling trailers, to get a jump on the passes we’d soon hit entering Utah. Entering Utah at 75 MPH with our train of vehicles wee were rolling along well, except on the big hills Mike and I would slow to just below 50 mph, as we had the heaviest loads, me maxing out my trailer’s capacity of 7,000 lbs, and Mike hauling a 37 foot enclosed trailer with both his and Steve’s big Jeeps inside. We were trying to make it into Timpanogos Harley Davidson for a lunch break, as Mike had never been, but Steve and I were insistent that he see it. Here’s where things get dicey… I watched and waved as the diesels pushed past in rush hour traffic, and I heard a pop, so I slowed down some to figure out what It might be and jump off at the next exit. I notice Molly (my motorhome) isn’t showing her usual race readiness, but once off the highway, she seems better so I try it again, still no power, calling ahead to let my friends know I’m a little behind, and having issues. Next thing I know a truck pulls past with a hand written note “Your trailer has a flat…” Oh great here we go. I’m in Salt Lake morning traffic with a flat, luckily it was the rear outside that blew, but my floor jack that I thought might come in handy was on the traffic side (note to self plan better next trip). After a call to Mike, it was decided to use my blocks to pull up on and lift the trailer. As I got the spare into position, a Utah State Trooper pulls up, and jumps out with mechanic’s gloves on and a 20 Volt Impact in his hand, saying let me get those for you. Now I’ve traveled all over this country, and in my 54 years, I’ve never seen a more helpful Stater! I don’t know if it was just this guy or if this is common practice in the Utah State Patrol, but it was AWESOME! Well done Utah State Patrol! As I once again try to get back into traffic, Molly still no power, almost as if she’s choking out, which shouldn’t happen on a fuel injected motor, and oh look I now have a check engine light. Calling ahead, again, saying I need a scanner, as luck would have it, Mike had his, YAY! Only issue is they are now 25 miles ahead of me already at the Harley Dealership. So they drop Steve’s 5th Wheel and roll back up to me and the scanner says all of my O2 sensors are bad, and my Mass AirFlow sensor is bad too. I’m thinking no way all 5 sensors went at the same time. Remembering the pop, and thinking it seemed starved or choked out we take a look at the air filter. Nice a massive K & N cone filter right up front. But wait, it’s been “back yarded”, it is connected to a 4 inch house heating duct 90 degree elbow, that is connected to Oh My F’n God, a dryer vent hose, you know the flexible collapsible, paper tube reinforced externally with duct tape, with a big hole in it! Obviously some idiot put this together probably right before trading it in. My mistake, not lifting the dog house when buying it. Needless to say after getting through all the jokes about running over to Home Depot for the fix, we eliminated the now disabled dryer hose, and utilized the elbow which was actually a multi swivel allowing us to create like an S tube wrapped it with Gorilla Tape to make sure she sealed and clamped it back together. And we were once again racing down to the Harley dealership, after a mere 2 hour debacle. A quick run inside for toilets, a soda and a flag and directions for fuel, and we were off again. Setting up a motorhome to most is stupidly simple to experienced travelers, and I’ve had many a camping outfit, but rarely in fact have never had all the hook-ups in any given place, so proved to be a challenge for me. I first leveled Molly, got the sewer hooked up, then the power I’m on a roll now, only need water. But then I got distracted helping Steve with something and listening how he had mistakenly once hooked his hose to the black tank flush. I returned to finish the hook-up and did the same thing, but quickly figured that out and got it to the proper place just as darkness invaded the awesome sunset. Ahhh finally time for another Beer. As I was getting my beer I noticed the refer was still on gas, and the microwave wasn’t blinking. Weird I was thinking, I was plugged in (having never been to an official campground with hook-ups, I didn’t know there was a breaker switch that needed flipped in the box next to where I plugged in)so I went out to investigate this switch possibility, sure enough I hadn’t flipped the breaker, and back inside I have power. Better wash my hands…No water pressure…? Did I not turn the water back on, when swapping the hose earlier? Nope, back outside, turn the valve finally I can relax and enjoy the company of the rest of the group! Of course it was just after 9 at home meaning 10 pm local and most everybody was done for the night. But luckily Mike and Angie were still out so I hung out for a couple of cold ones before calling it a night. It had been a long day and tomorrow was sneaking up fast so I went to bed awaiting our first payday in Moab the promised land for Jeepers.